Buongiorno! 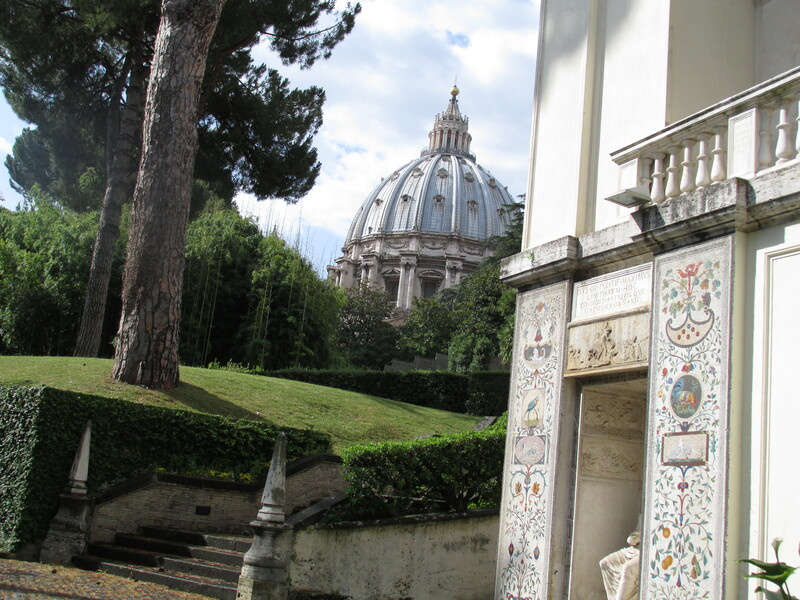 We were going to spend this rainy day in the smallest country in the world, the Vatican. We made an extra effort to make sure we looked appropriately as we were about to visit the birthplace of Catholicism. I had mixed feelings as I’m not a believer. 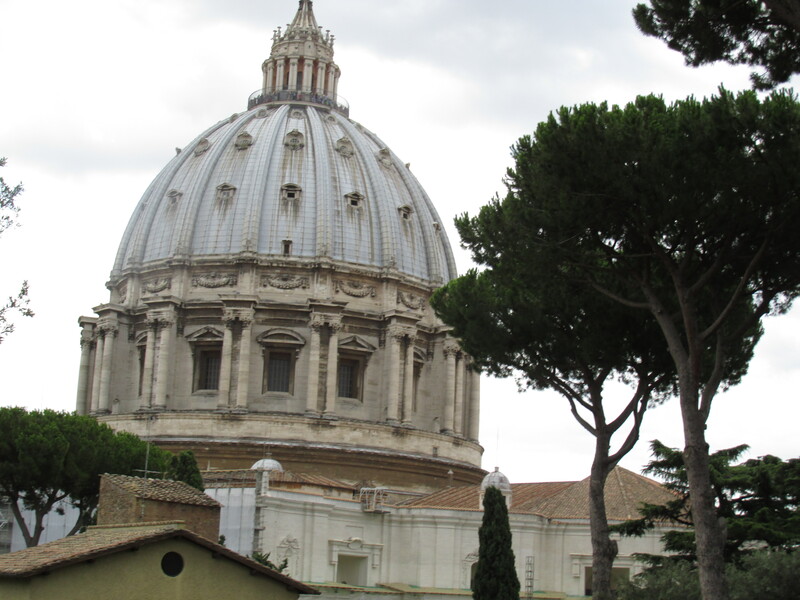 But there is one thing I noticed during my stay in Rome – they see religion as one of the parts of their multi-faceted culture , without giving it any specific prominence. Just as the other night, we felt free to enter a Catholic church without having our beliefs (our disbeliefs for that matter) questioned. No one would force you to convert to what seems to be at odds with your perception of the world. All you are asked to do is show some respect. Therefore I decided I would make it an experience to nurture the spiritual side of me in the place full of opulence and grandeur. Educating myself to become a better me – that was my religion! That was an early start for us. We walked to the metro station through the puddly Via Nazionale that was still queit at this time of morning. 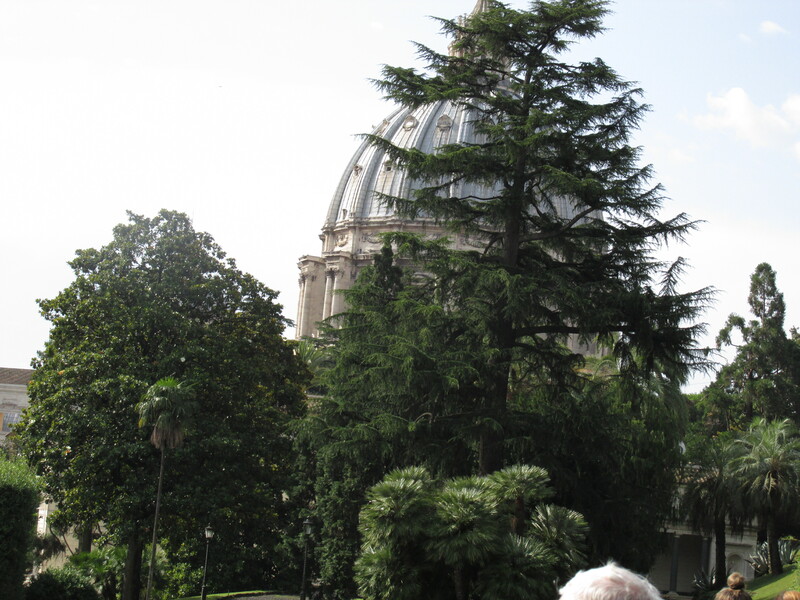 That was a new colour of Rome for me – calm and drizzling as if about to delve into the serenity of prayer… I see prayer as a tool powerful enough to prompt us to believe in the celestial strength of our own voices to reach out to whatever we believe is high above. We hopped on the metro and it was not busy and I discreetly watched the people on the car figuring out who they might be and what they were up to at this early hour. There was a group of friends who seemed to be American and one of them got off the car at the wrong station and got back onto it before the doors closed as his friend started yelling “What are you doing?” I thought that would be a perfect example for the use of the Present Continuous! I just love it how grammar comes alive in actual communication. 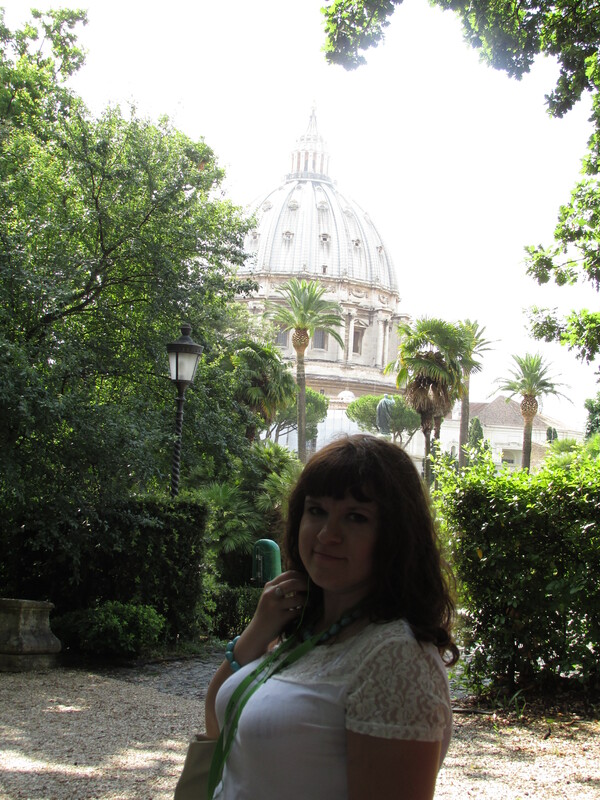 We got off at Ottaviano Metro Station and made our way towards the walled enclave of Vatican City. We were still in Italy. There’s no physical border between Italy and the Vatican and as we had a reservation for a guided tour, we were lucky to skip the soaking-wet lines of people and after an awkward interaction with an Asian-looking man made our way inside. 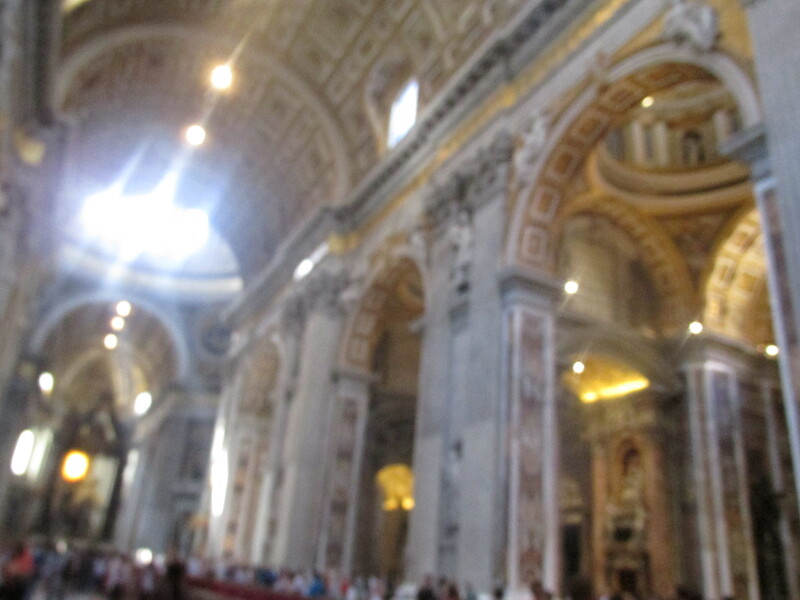 We were in the Vatican! Just as simple as that! I had imagined an elaborate security check but there wasn’t any at all! Welcome to the spiritual capital of the world! So far I felt comfortable here being a non-believer and deep down inside I knew I would. 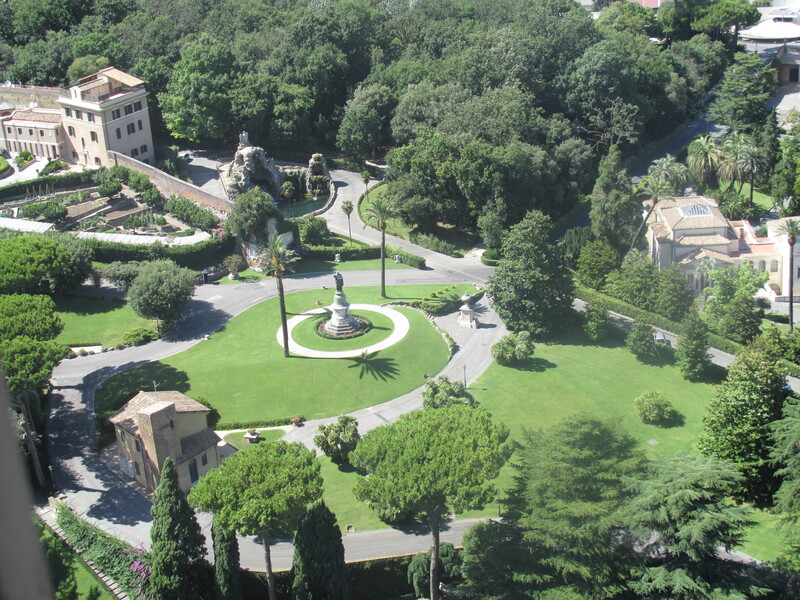 We had a tour of the Vatican Gardens booked. 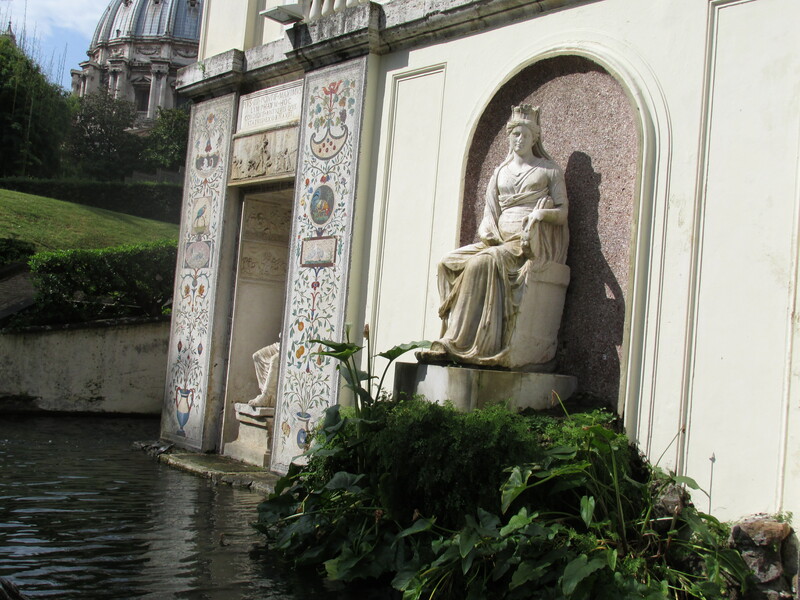 You will be denied an admission unless you are on a guided tour as it is the Pope’s property. It felt as a privilege to be allowed into this private and mysterious world entangled in religion, business and politics. 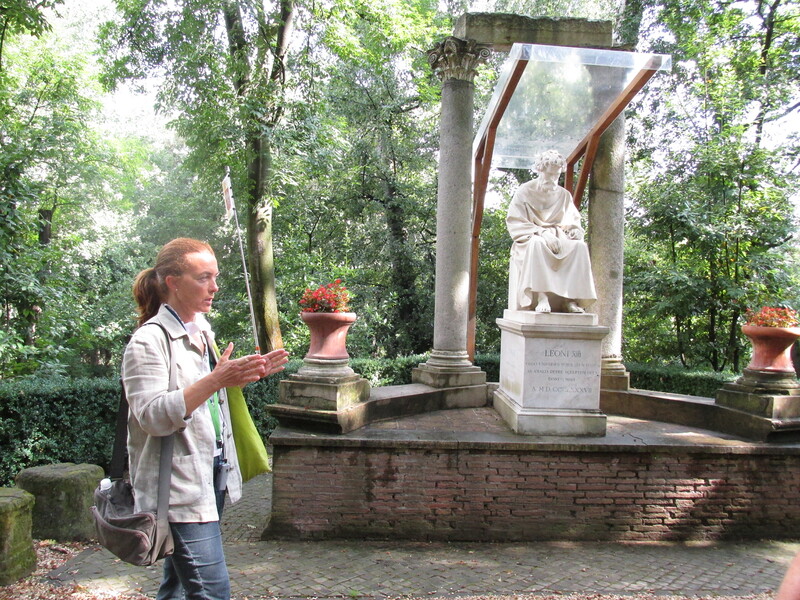 We met our Italian guide and joined a group of about 20 tourists from all over the world. 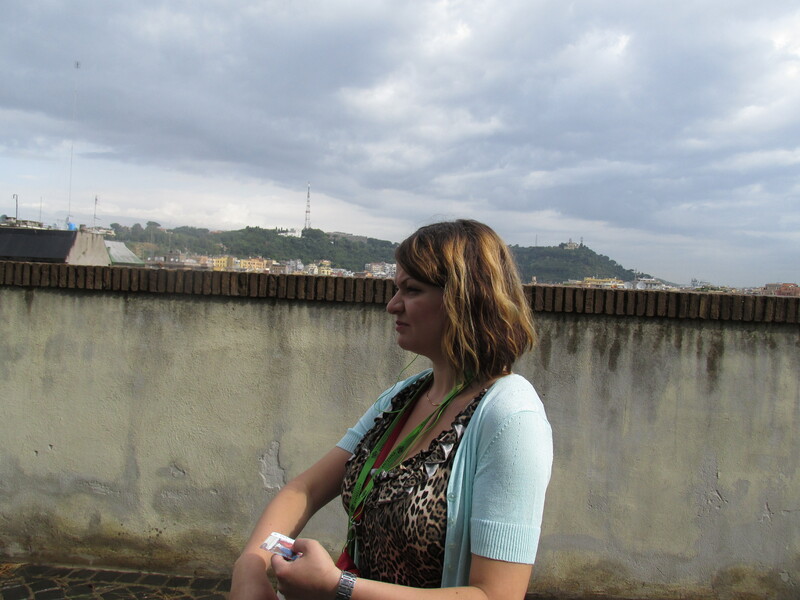 We went through the security accompanied by our guide and encountered the rainy sky of the Vatican. We were warned we would have to keep up with the group as walking the area on your own might alert the security. 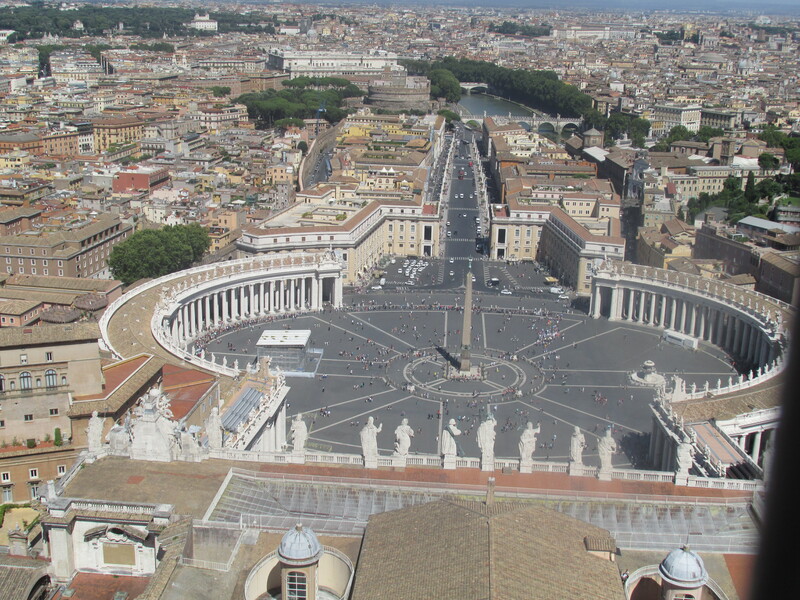 We got the views of the Vatican Museums and awe-inspiring views of the Dome of course – just like nowhere else! It was a majestic close up and we were really very-very close to it! It was a beautiful area perfect for reflections. 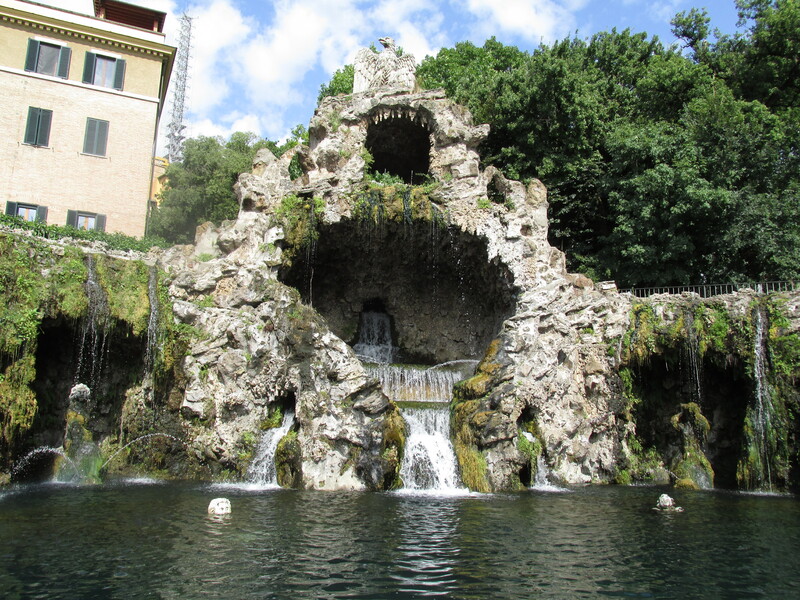 We walked past extraordinary fountains (remember about my fascination for them), grottos. 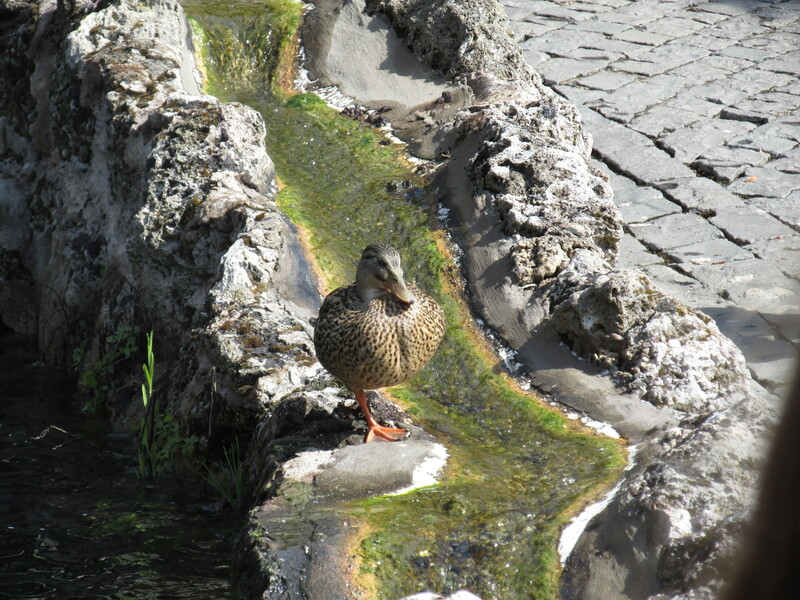 It felt as a very secluded and personal tour as there seemed to be no one around except us. There’s so much more to this place than we can fathom and so much still remains unrevealed to wider audiences. Religion is a very dark and obscure business after all. We will never find out what kind of conspiracies have been plotted outside these walls for hundreds of years. For the moment our business was to enjoy our tour and remember this moment to treasure just like all the unique moments of our travels. 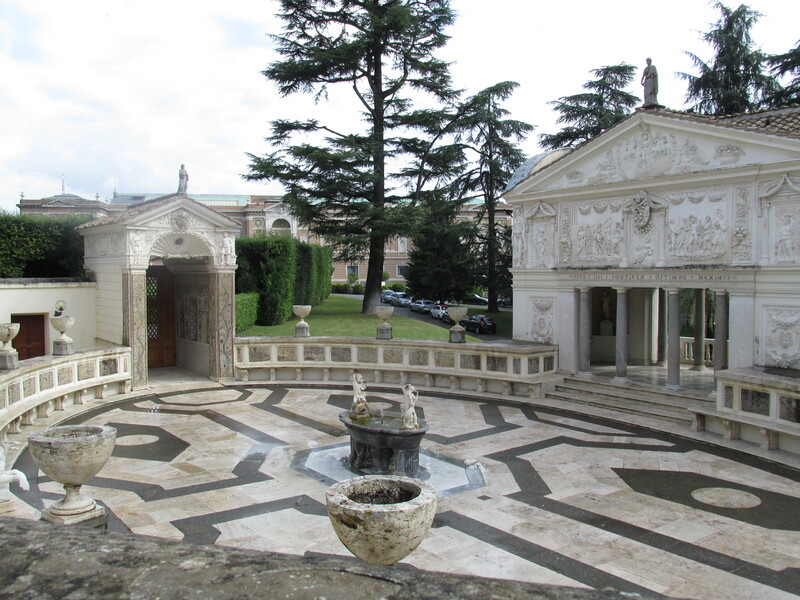 This lush green area offered a lot for us to see – the Pontifical Academy of Science, a replica of the Lourdes Grotto in France. The beauty of the space might be enough to induce an atheist to convert… The smallest state also boasts its own radio station and a railway station! 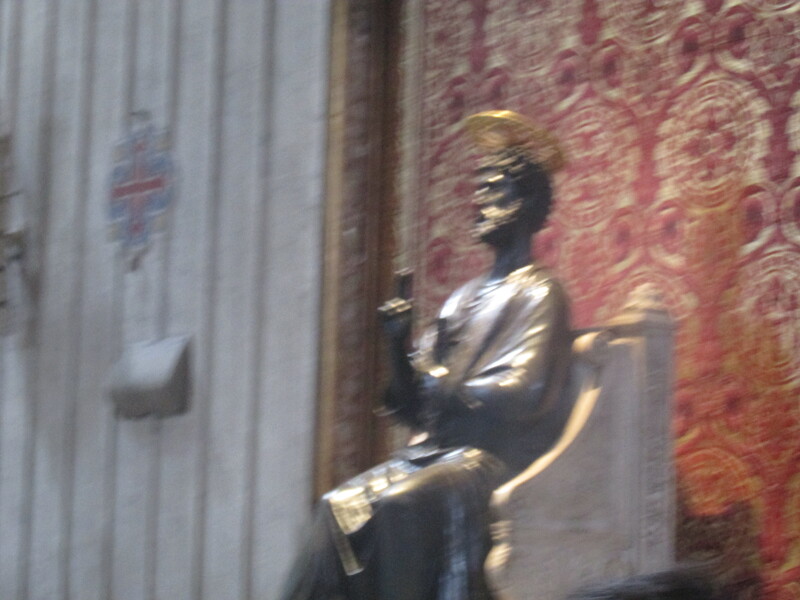 Now it was time to visit the extraordinary Vatican Museums. We needed a brief recharge first and went down to the cafeteria. 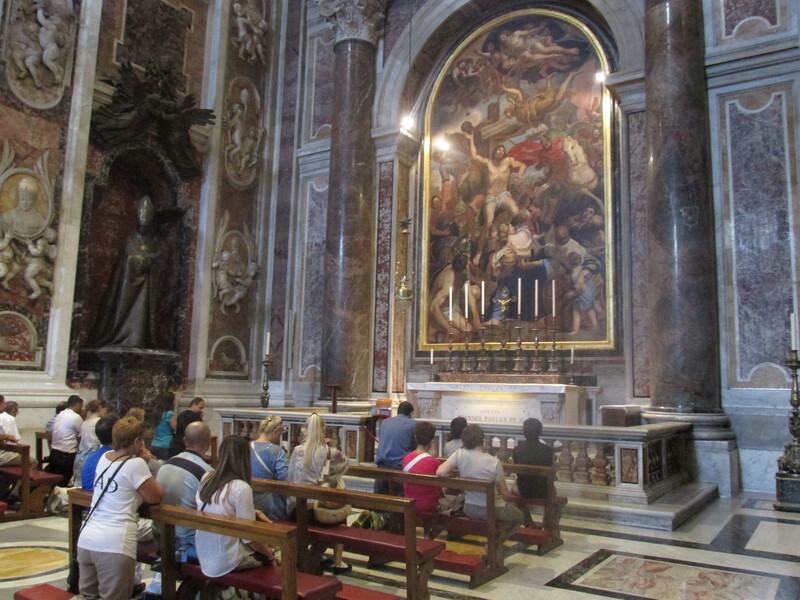 The place was packed with tourists and I found myself wondering how many of them were actually religious and does one really have to be while visiting the Vatican…? My sister was being grumpy about crowds of people around and desperately needed some coffee to recharge her energy levels. Just the other day I was mistaken for an Italian and this time around I was mistaken for a Spanish by a Spanish girl who was desperate to find the ticket office and there was a bit of misunderstanding and I ended up giving her the wrong directions and I’m genuinely sorry about that. My sister was perking up a bit and we headed towards the Museums and found ourselves just outside the Vatican post office surrounded by people writing cards. It was before I started a newly-found hobby of mine, which is postcrossing. Basically what you do there is you send cards to random people all over the world and get cards back from other random people, it’s a lot of fun! It was my first time speaking Italian as I addressed a man at the desk asking him if he spoke English. It’s such a great feeling knowing how a simple sentence in a new language can boost your confidence! Yay, he understood what I’d just said!!! I posted two cards – to my parents and my wonderful teacher who I know will be reading this! My cards safely reached the recipients so the Vatican Post is efficient! So our tour began. The area is just immense! The scale of the collection is unthinkable! We started off with the Ancient World. 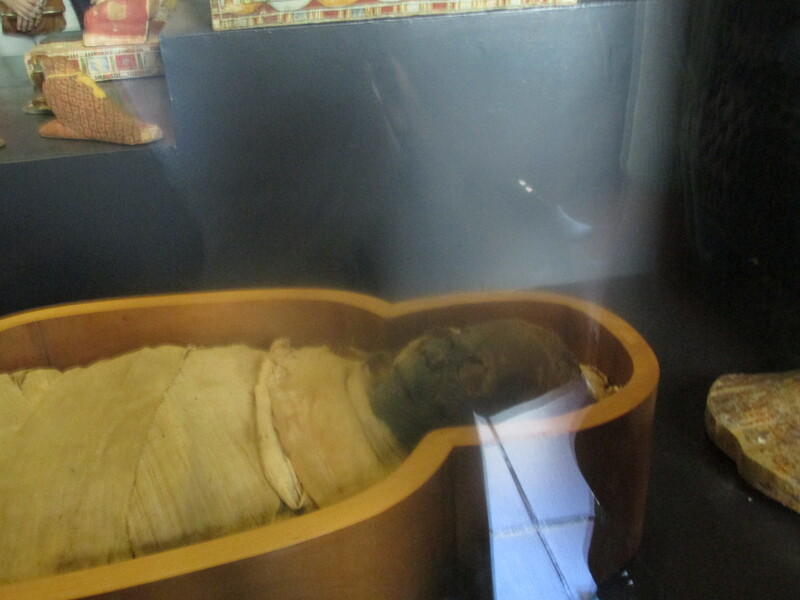 The first exhibit on display to remind us of inevitability of the end was a mummy of an individual who died about three millenia ago! That’s how it all ends. Was there by any chance anyone in this room remotely related to this person whoever they were? 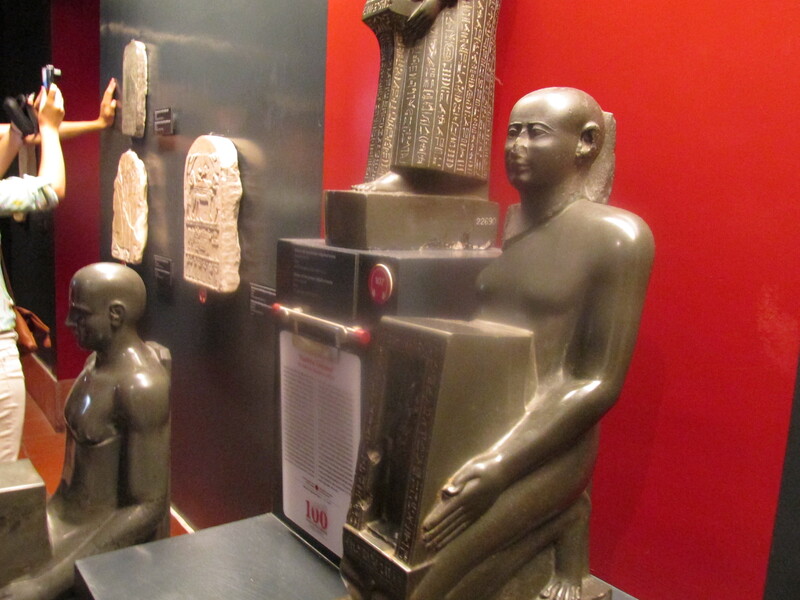 I’m not sure being here on display for thousands of people to scrutinize was their idea of an idyllic afterlife… The Egyptian sculptures were magnificent and made me eager to set out on an educational tour of the country. 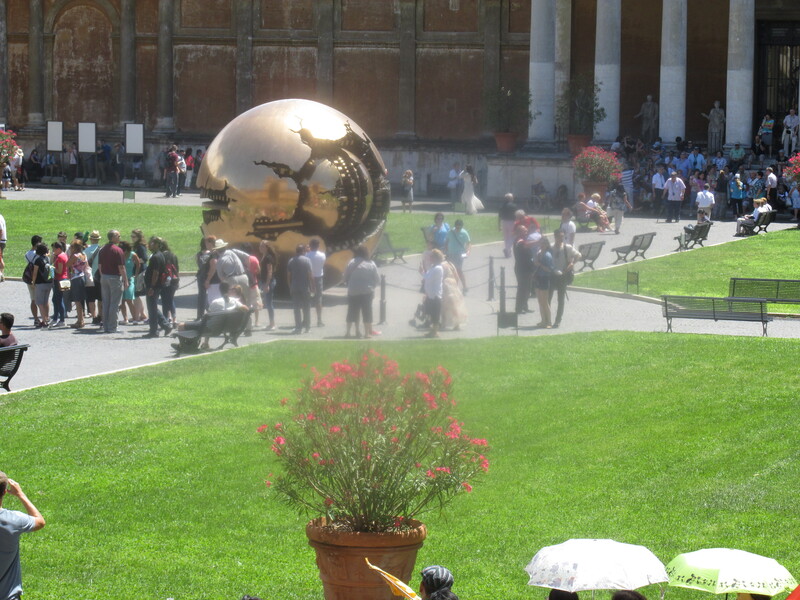 We got a nice view of the famous “Sphere within Sphere” by Arnoldo Pomodoro in the court through an open window. Yes, that was a more open side of the Vatican many of us are familiar with. 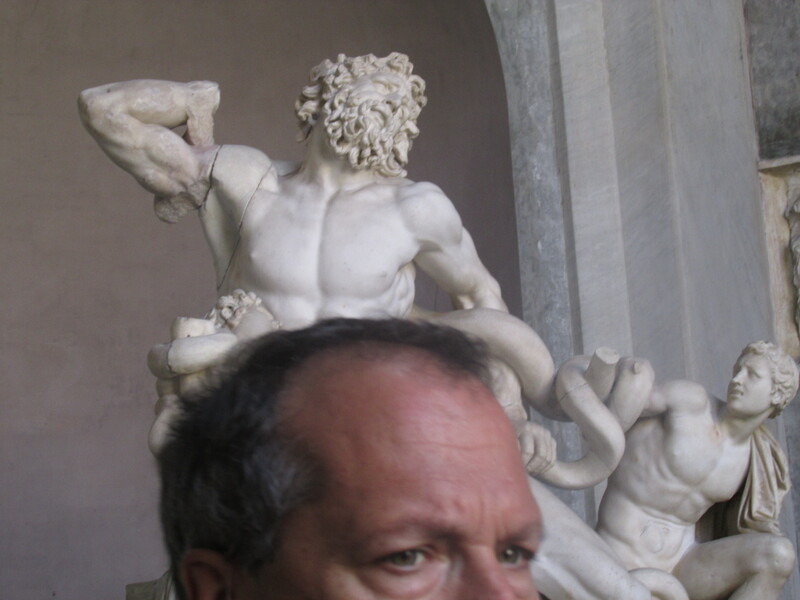 Now we were off to Greece known for its tremendous influence on the culture of the Romans. 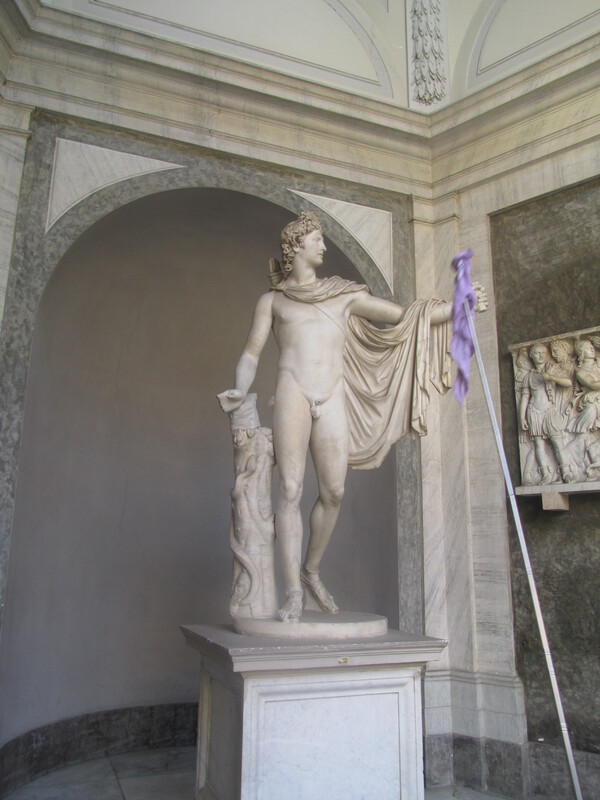 “The Apollo Belvedere” sculpture was the highlight of this section. 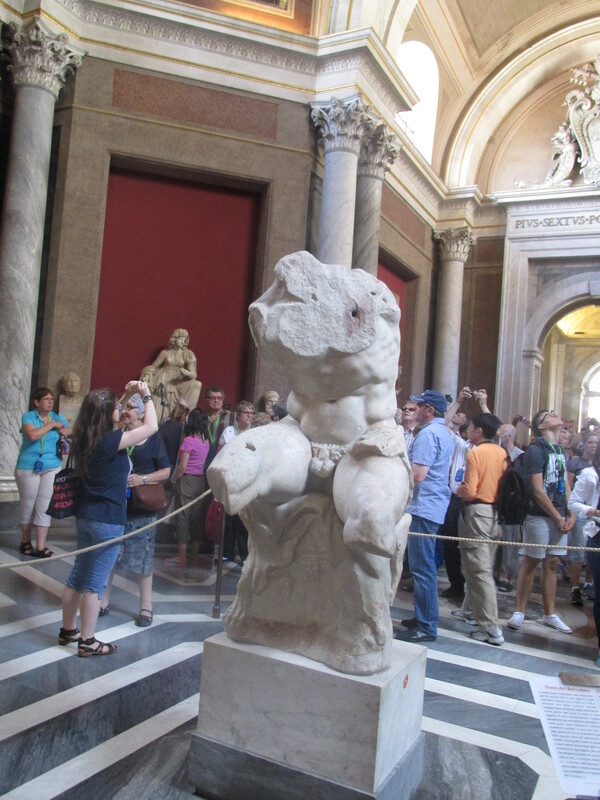 The statue of Lacoon was awe-inspiring as well as the Belvedere Torso. Greece was on my list of countries to visit. 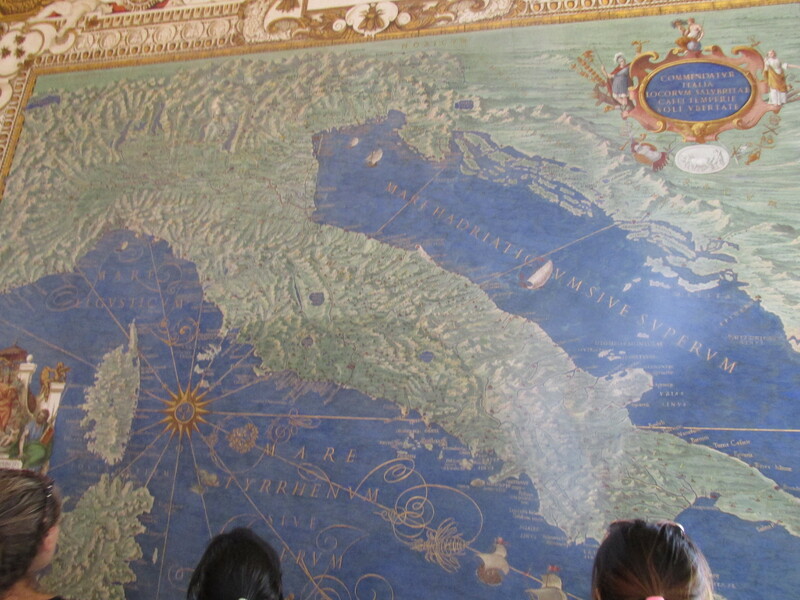 The map gallery gave us a feel for different regions of Italy. 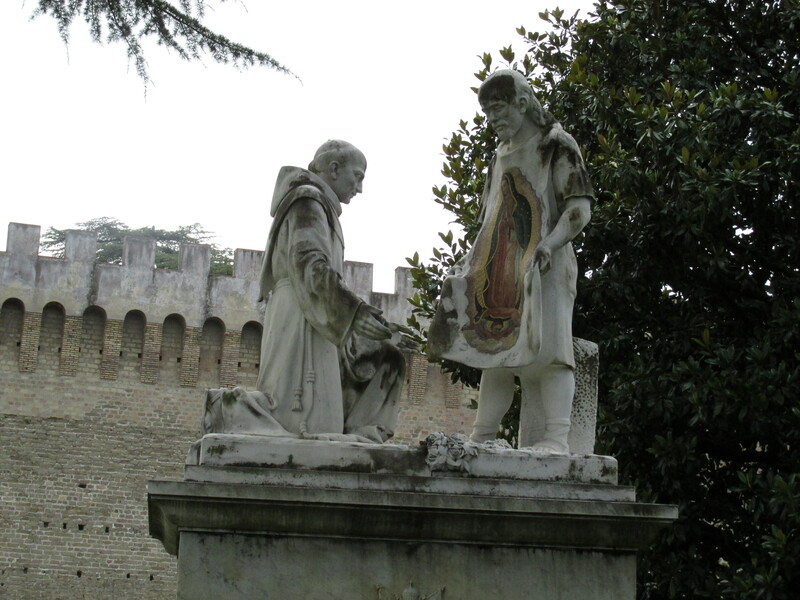 Now it was time for the period that saw the rebirth of the ancient tradition – the Renaissance. 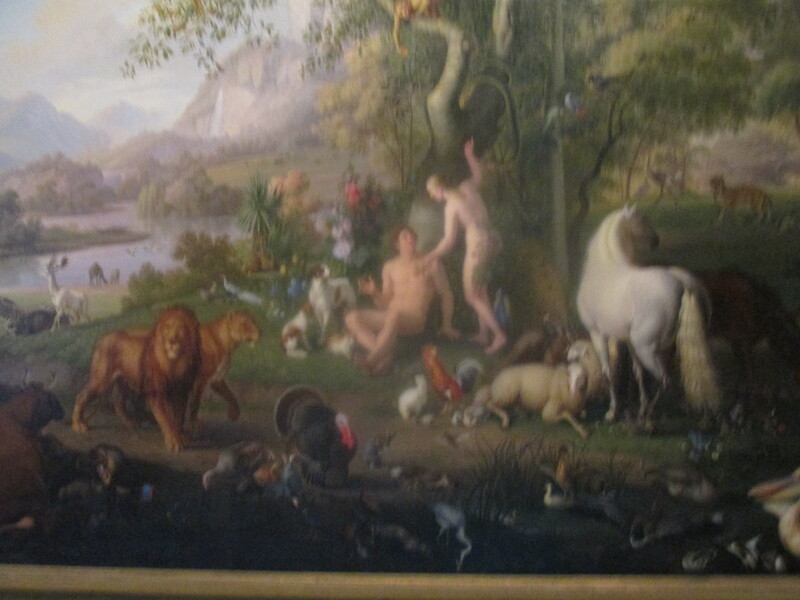 The Raphael Rooms displayed the climax of this glorious period dealing with beauty in ways embracing the remote past. 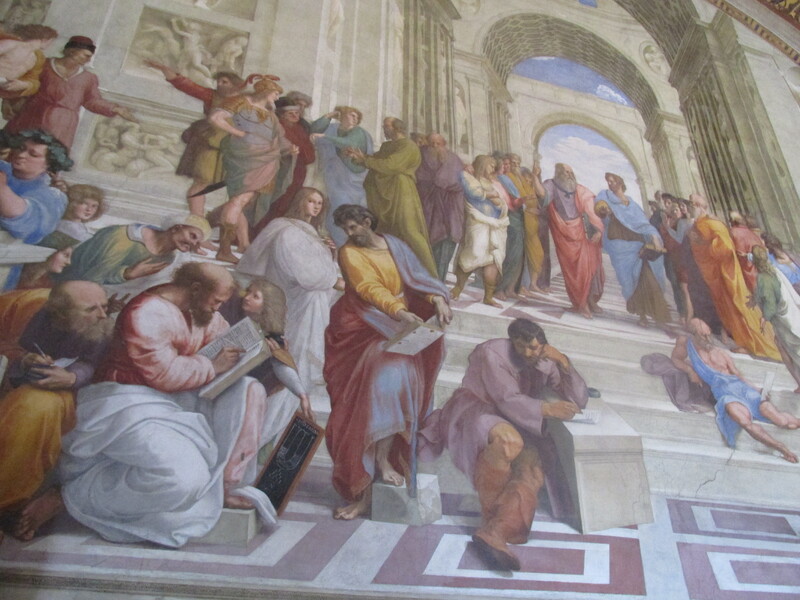 “The School of Athens” featuring the VIP’s of science and art was a marvellous piece of art to exaimine close up. It was really humbling. 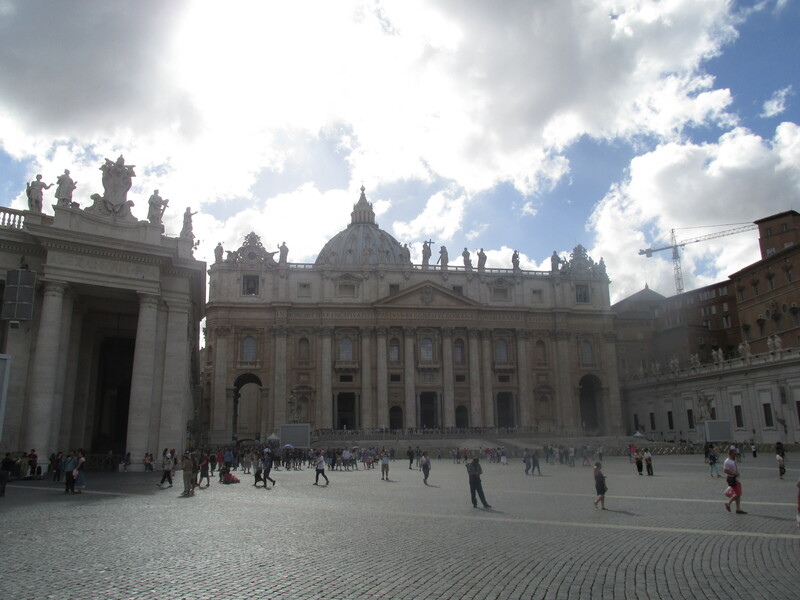 We made our way to the exit straight towards St.Peter’s Basilica. 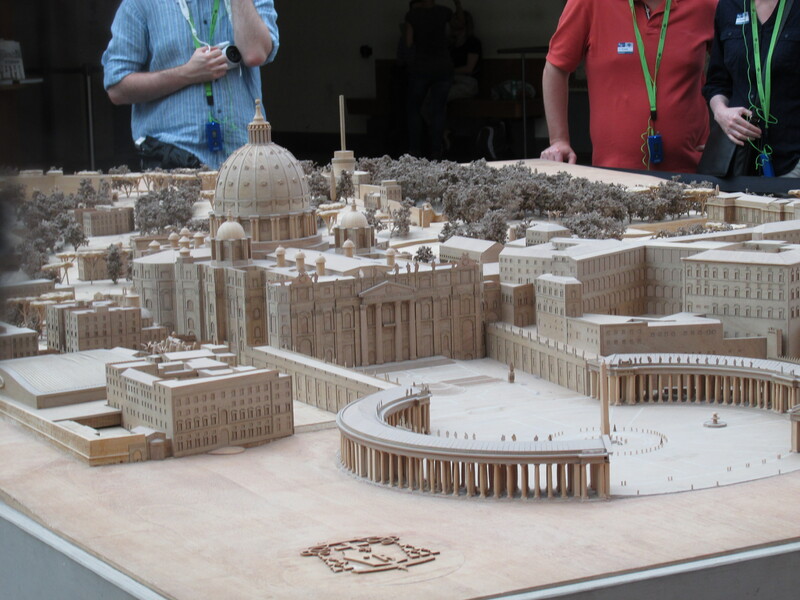 The Vatican wasn’t as hard to navigate as my guidebook suggested. We had to make sure we had enough time to climb up the Dome before it was closed. We got our tickets to take an elevator and walk the remaining 323 steps to get breathtaking and enchanting views of Rome. 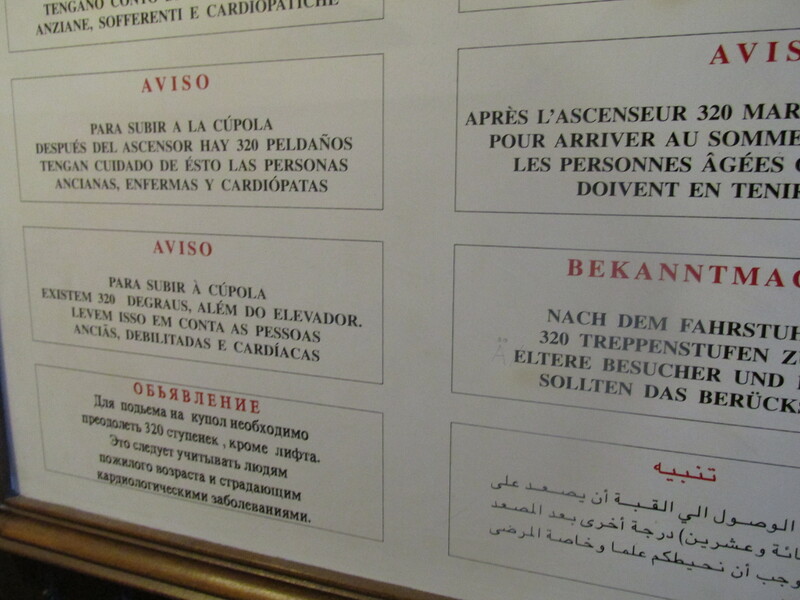 When we got out of the elevator, we saw warning notes saying that people with heart problems should avoiding climbing all the steps. When you see signs like this, it makes you question your own medical condition. 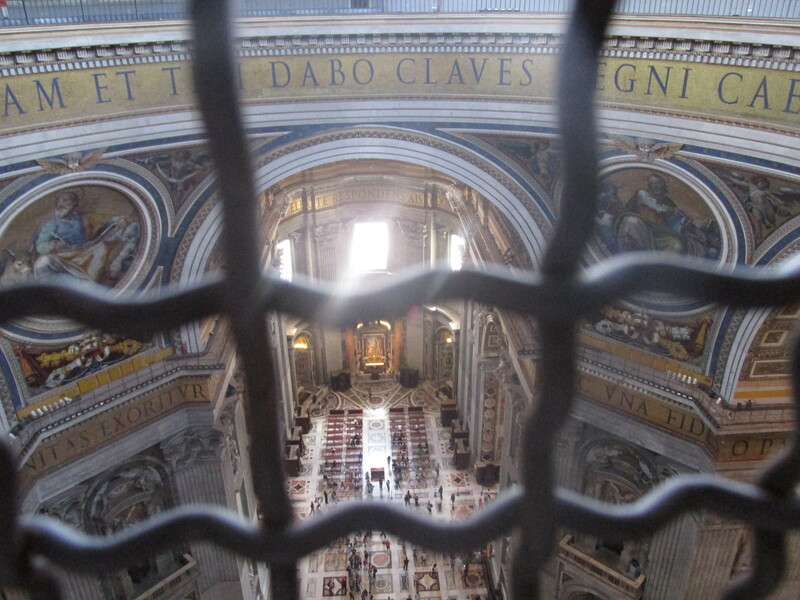 We got a sneaky peek at the Basilica and its lavish decorations from up there. How terrifyingly beautiful! 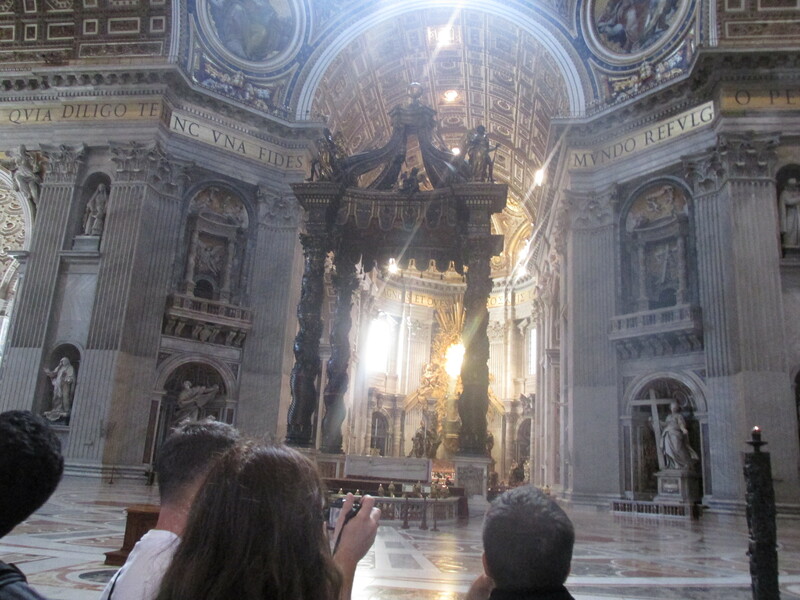 Here we were in one of the most celebrated churches in the world! How terrifyingly beautiful! 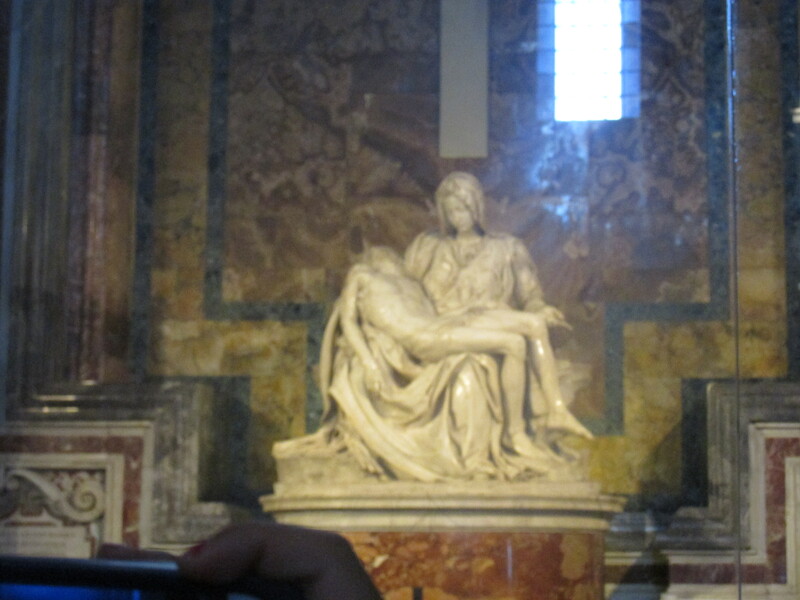 Here we were in one of the most celebrated churches in the world! It was a sweaty walk and I found myself almost out of breath at some point, after that it got claustrophobic as we were almost at the top. The postcard view of Rome we got when we finally elbowed our way to the railing made it all so worthwhile! I phoned Mum to tell her how high we got! We aimed big! It wasn’t a picture – it was real! We were on top of the world, the highest you can get in Rome! Still pensive and reflective (and a bit tired), we left the church to find ourselves in St.Peter’s Square bustling with people. 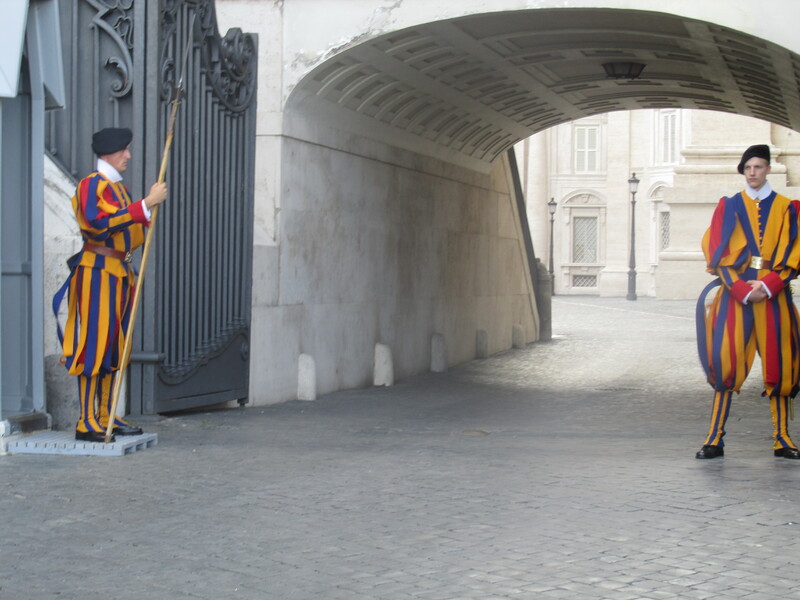 We got a glimpse of the famous Swiss guards in colourful outfits. We found a good spot in the shade near the Egyptian obelisk and let the square embrace us in its concret arms and this is what underpins its architectural design. We had been embraced for about an hour letting the impressions of the day sink in… It was one of the most famous and recognizable squares in the world and here we were just busking here. Just thinking about the events that had happened right here where we were sitting was incredible! How many people had come in hope of meeting the Pope who wasn’t there in this time of the year and right over there was his window and the famous pipe which is used to signalthe election of a new Pope. Religion is so complex and it was comforting to realize that through this day I’d spent in the smallest and holiest state I hadn’t felt under pressure to revisit what I believed was me and my own religion, something that was still shaping up and that day would definitely make a long-run contribution. Arrividerci, Vaticano! We were now on our way back to the other part of the city where our hotel was located. 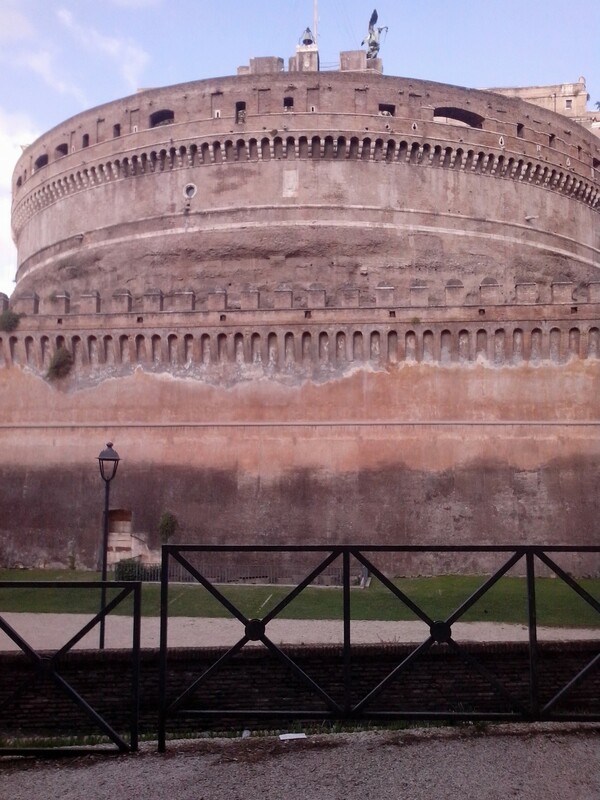 A short walk from the square was the famous Castle Sant’Angelo or the Mausoleum of Hadrian. It was an imposing building rusty with ancient memories. We walked to the back of it where there was a playground to rest our feet again. There were children playing right behind this place dating back to the 130s AD! The present is what we are all here for and it’s about enjoying the moment! 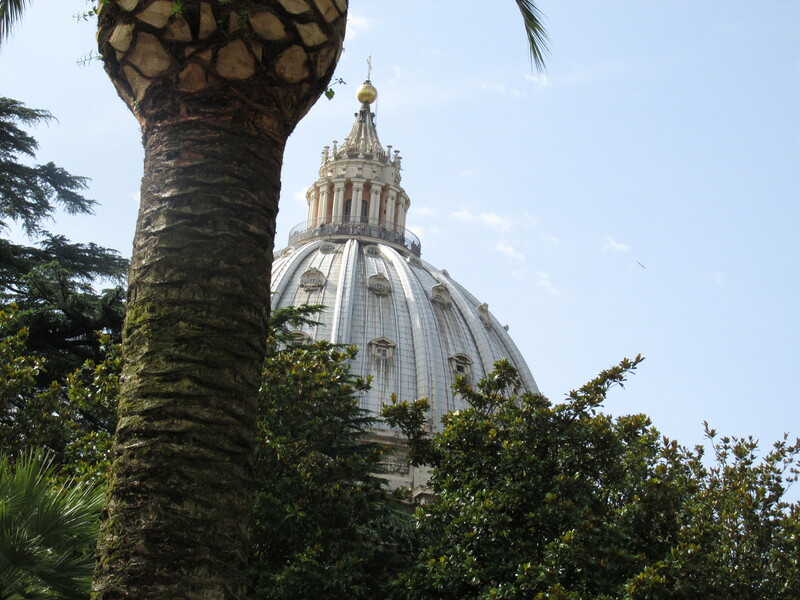 Then we went along the famous bridge lined with statues of angels and admired the iconic views of the Dome surrounded by the queit Tiber. 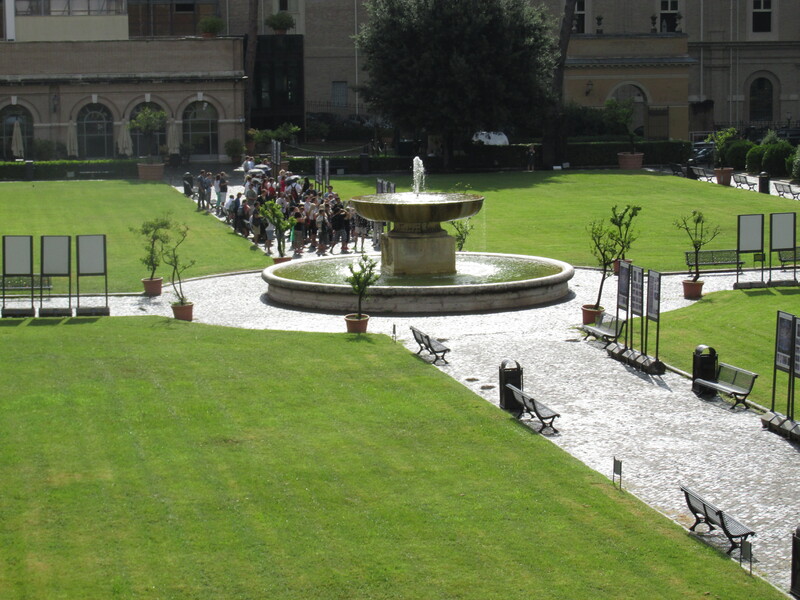 It’s a very popular place for romantic photoshoots in Rome. 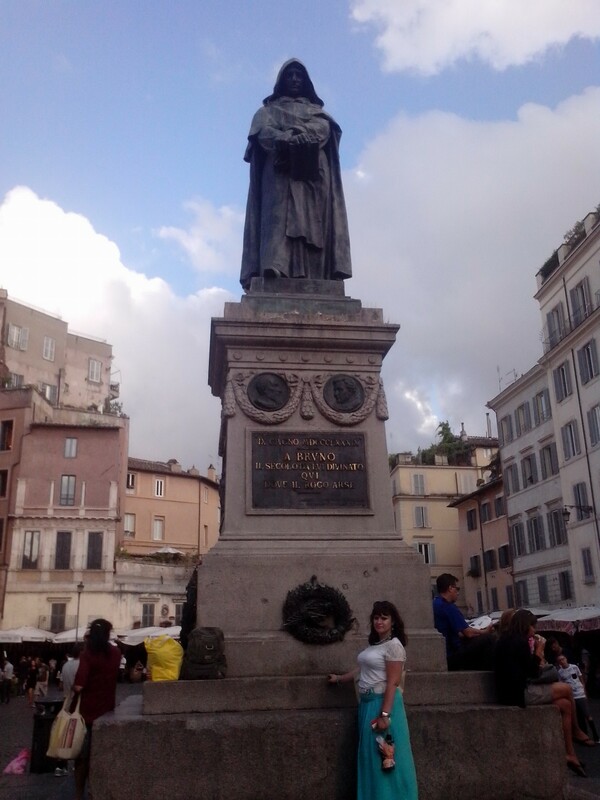 Our last mission for that hectic day was visiting Campo de’ Fiori (Field of Flowers) with a monument marking the place where Giordano Bruno was executed in 1600. What a beautiful piazza to savour as the sun is going down. There are flowers at the monument to the famous freethinker. Everyone standing up for what they believe in is worthy of genuine respect and admiration. We decided we would stay here a while and were looking for a place to have dinner. The staff of cafes and restaurants would go out of their way to get their customer and to some it seems to come as second nature. We came across such a guy. He was absolutely charming and courteous and invited us to take a seat overlooking the square. It just amazes me how Italian men seem to know the right things to say to make our hearts melt. A lot of them have the whole package – the looks and manners. Even if they do it for their own benefit (which was certainly the case), they leave you feeling pleased and charmed. I think this guy really belonged in this job and could make a good living if he came to Russia. The places nearby were half-empty and the place we were at was getting packed because of this guy working his charms on the crowd. He did have a way with customers! When we got seated, the orchestra started playing a famous nostalgic song about evenings in the outskirts of Moscow. They were playing it for us obviously as we had mentioned where we were from! 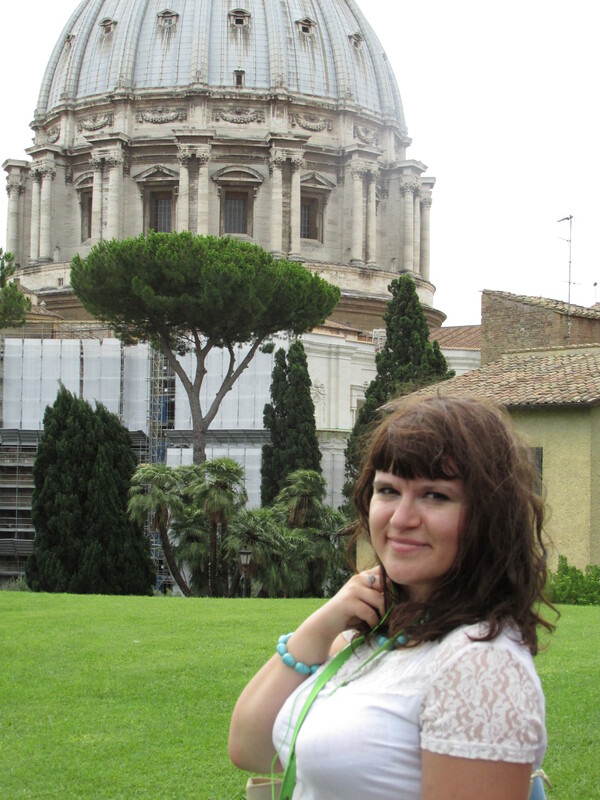 What is it about Rome and music that makes my heart swoon…? 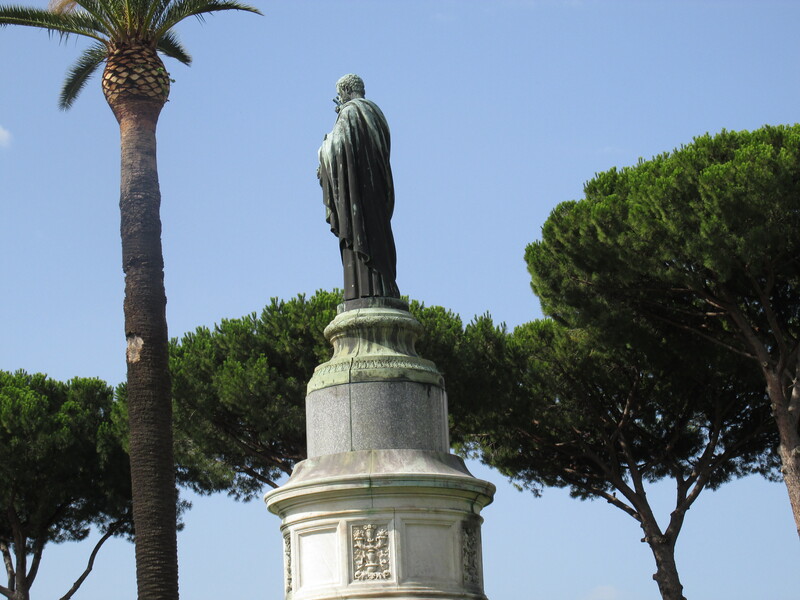 Our meal was bellissima of course and we raised a glass to Giordano Bruno standing here covered in his coat against the pensive Roman sky. The second toast was to Italy and its people (especially males)! The guy at the entrance got the whole place packed and was now flirting with a waitress from a nearby café. That’s multitasking for you! Can a healthy Italian male go through a day without flirting? 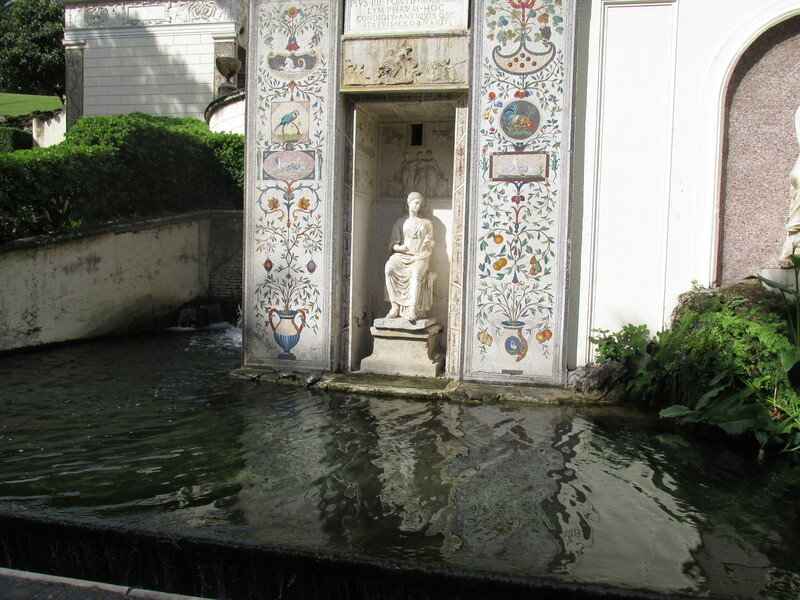 It is what gives the daily drudgery a taste of la dolce vita even when la vita is tough on you! What a marvellous place! And there is an Italian flag over there – bellissima! 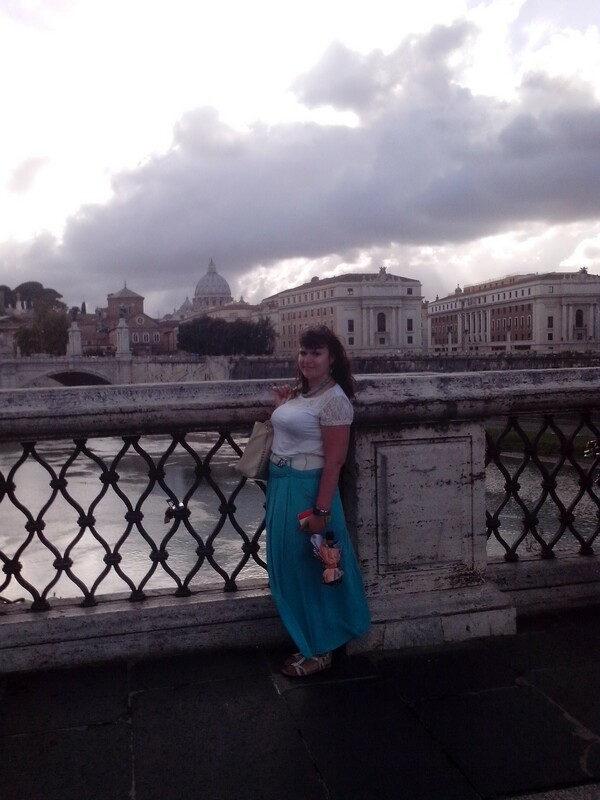 What was it about Roman evenings that made me wish they had lasted forever…? I’ve got to try and cook those amazing gnocchi with a beautiful cheese sauce back home! I’m a big lover of cheese and combined with the charm of Italian men and the serenity of Roman evenings, it boosts my sense of wellbeing and make me fall head over heels with la vita! Grazie mille! On our way to our hotel we popped at Largo di Torre Argentino that was just around the corner to watch the Roman cats. What were they up to as the night was approaching? Did they feel lonely? Anyway, we were pleased to keep them company for a while if they needed any. I loved being here at this time when there were hardly any people. I love being out at night as it makes me feel I’m more in control of where I am – I’m there because I feel like it and even though it’s late! Enjoying the moment rather than going to bed and missing out on all the felicita has this sweet rebellious edge to me I believe… More late-night views of my favourite snow white monument, another dolce gelato and here we are in bed with our reflections and fantasies (of varying degrees of holiness) staying true to our religion! Amen! Bonne Nota! 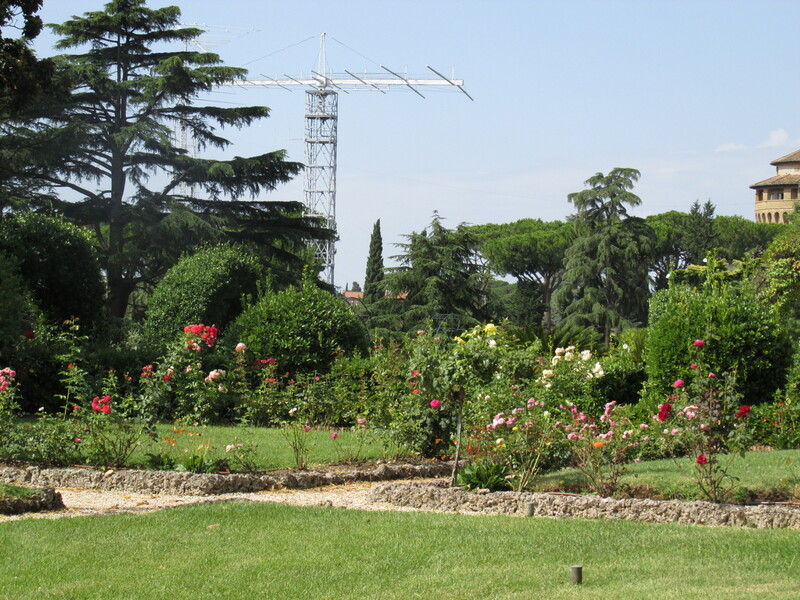 I didn’t realise that it was possible to tour the Vatican gardens and will definitely be booking a tour next time I’m in Roma! 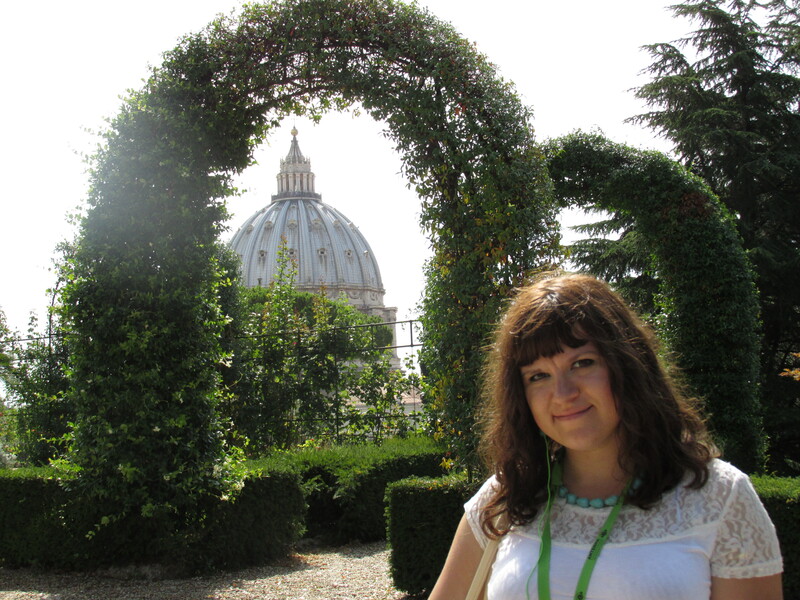 A great account of your Vatican visit, thanks for sharing! You are welcome! I’m really happy you loved this piece. 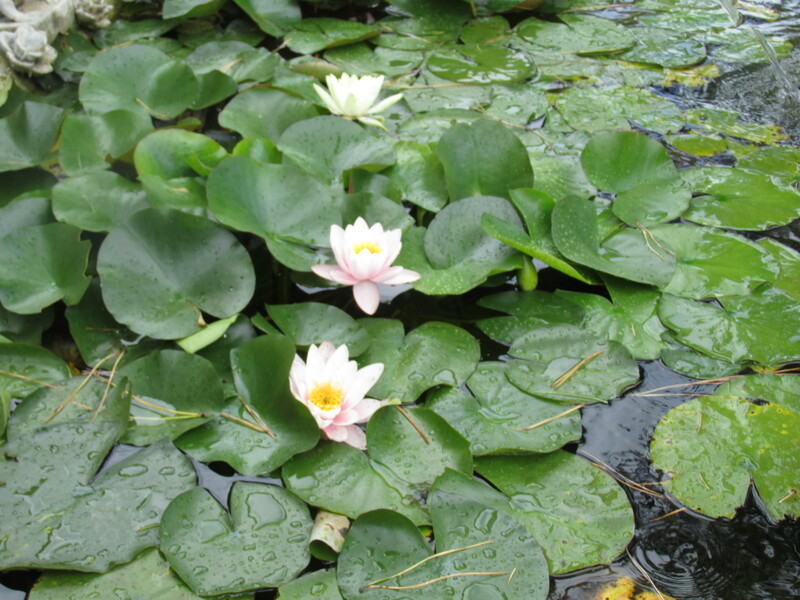 Yes, it was only by chance that we found that out and we never regretted we had booked this tour. Just make sure you get your reservation in advance! It’s a truly unique place to explore. Enjoy!